The new advertising campaign for the Gucci 2019 jewelry collections channels the spirit of freewheeling, carefree travel and possesses a playful, mood that perfectly showcases the aesthetic of the designs. 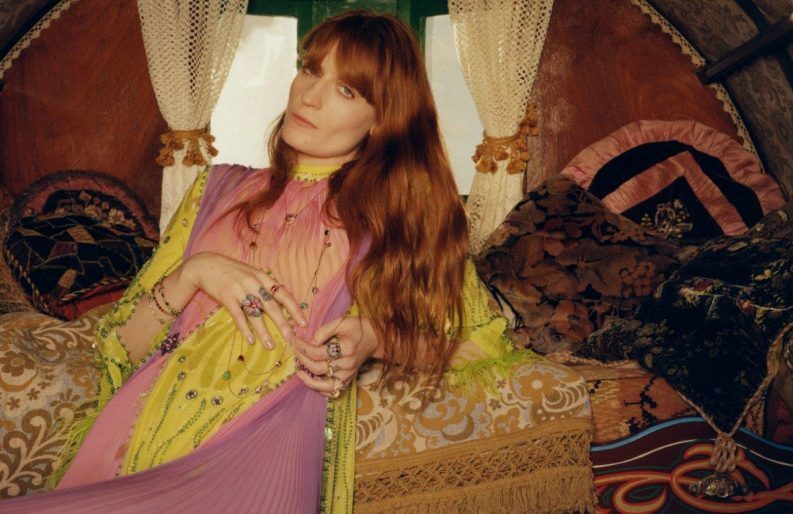 Featuring long-standing friend of the House musician, singer, songwriter and producer Florence Welch, who is Gucci’s jewelry ambassador, the setting is a retro style wooden wagon, overflowing with colorful furnishings and trinkets. Welch reclines on beds of cushions and decorative fabrics within, or sits outside dreamily peering out at the viewer, adorned in Gucci’s highly stylized rings, bracelets and necklaces. Set-off beautifully by the colorful and evocative images, the pieces are principally from the Le Marché des Merveilles, Gucci Ouroboros, Gucci Flora and Dionysus fine jewelry collections and the House’s silver jewelry collection.